Home / Tutorial / Adobe Illustrator / What is Graphics and types of Graphics. I am going to start detailed video tutorials on various softwares of Graphics Designing (Adobe Illustrator, Adobe Photoshop, Corel Draw), Audio Video Editing / 2D Animation (Sony Sound Fordge, Adobe Premiere, Adobe After Effects), 3D Modeling, Texturing, Lighting, Rendering (3D Studio Max) etc. I am starting from Graphics Designing and the first software which I am going to teach you in this regard is Adobe Illustrator. Before starting I would like to give you little introduction about the Graphics. 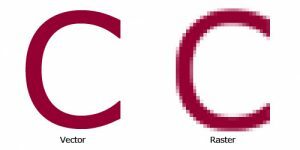 Before going ahead it is better to understand graphics and graphics types. So first of all what Graphics does itself means.? It refers to any computer device or program that makes a computer capable of displaying and manipulating pictures. The term also refers to the images themselves. We can make vector raster graphics with the help of Adobe Photoshop, GIMP, Corel Photo-Paint and vector graphics with different vector softwares likes Adobe Illustrator, Corel Draw, Freehand, Quark Express etc. But in our course we will cover Adobe Photoshop for raster graphics and Adobe Illustrator and Corel Draw for vector graphics only. Normally Logos, Brochures, Business Cards, Stationery items, Books publication etc are done on vector softwares and picture editing, photo retouching and manipulation, flyer designing, compositing,web templates, gif image based animations etc are made through raster softwares. This was a little introduction of graphics and its types, in next lecture we will start learning Adobe Illustrator first part in which we will learn about interface and some tools of the software.